Chronic lymphocytic leukemia (CLL) is characterized by substantial clinical heterogeneity, despite relatively few genetic alterations. To provide a basis for studying epigenome deregulation in CLL, we established genome-wide chromatin accessibility maps for 88 CLL samples from 55 patients using the ATAC-seq assay, which we complemented by ChIPmentation and RNA-seq data for a representative subset of samples. Furthermore, we devised a bioinformatic method for linking these chromatin profiles to clinical annotations. Our analysis identified sample-specific variation on top of a shared core of CLL regulatory regions. IGHV mutation status – which distinguishes the two major subtypes of CLL – was accurately predicted by the chromatin profiles, and gene regulatory networks inferred for IGHV-mutated vs. IGHV-unmutated samples identified characteristic regulatory differences between these two disease subtypes. In summary, we found widespread heterogeneity in the CLL chromatin landscape, established a community resource for studying epigenome deregulation in leukemia, and demonstrated the feasibility of chromatin accessibility mapping in cancer cohorts and clinical research. Download the complete set of analysis outputs. 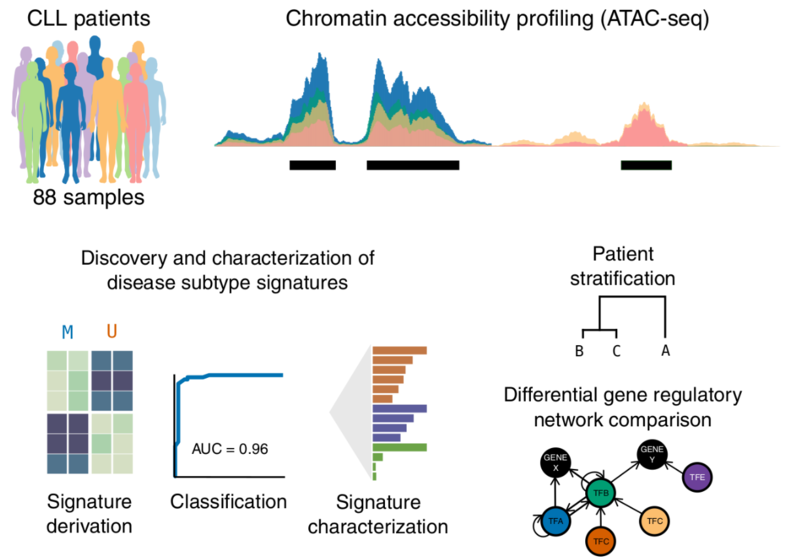 Chromatin accessibility maps of chronic lymphocytic leukemia identify subtype-specific epigenome signatures and transcription regulatory networks. Nat. Commun. 7:11938 doi: 10.1038/ncomms11938 (2016).